It is three o’clock on a deceptively sunny Wisconsin afternoon, and I am sitting on a rock at the edge of Devil’s Lake with a lit American Spirit in one shaky hand and a can of Coors in the other. The skies directly above the lake have cleared and the brilliant post-thunderstorm sunlight is bouncing off the glassy surface of the lake. Just offshore, an assembly of hungry mallards dives for tiny fishes, stirred to the surface by the frenzied rain. A crack of thunder draws my attention to the bluffs high above the west side of the lake, from which we have just descended. I count—one, one thousand; two, one thousand; three, one thousand—until I get to ten. Lightning flashes in the distance; the storm has retreated and we are, for the moment, safe. I finish my beer in one long sip and dip my feet into the still-frigid water. It feels good, and my shivering subsides a little. Next to me, Mel takes a drag of her cigarette, tilts her head back, and exhales. We are down, alive, and only slightly worse for wear. 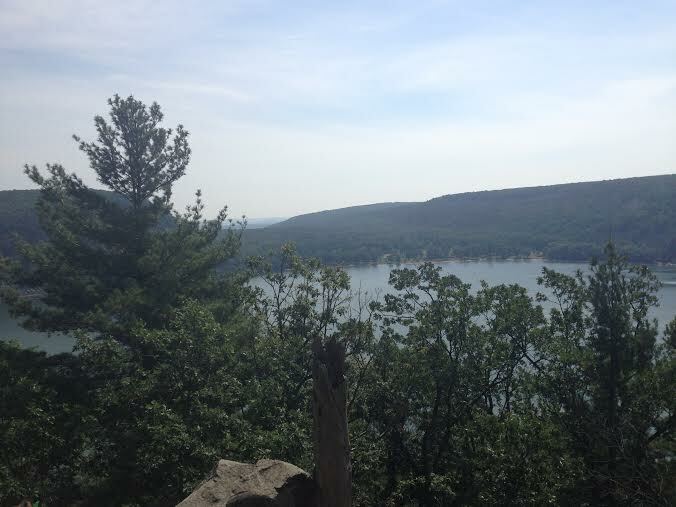 Devil’s Lake on a humid August afternoon, as seen from the aptly named Misery slab. Devil’s Lake has a reputation as one of the toughest climbing areas in the Midwest, maybe in the country. Routes here are notoriously sandbagged, a result of their having been first climbed in the 1940s by alpinists training for climbs in the Tetons, and then, later, by the drug-addled twentysomethings of the DLFA, a group of 1960s-era hardmen whose name I won’t repeat here. 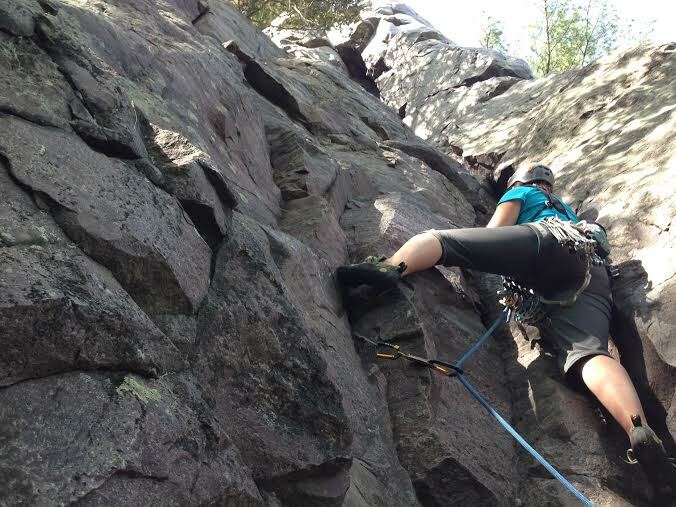 The difficulty of climbs at Devil’s Lake is compounded by the fact that they’re all on quartzite, whose sinister-sounding name indicates its fickle quality. This slick brand of rock patently wasn’t meant to be climbed at all; scaling it is akin to clawing your way up a wall of smooth glass, the friction of your rubber rock shoes only slightly delaying the seemingly inevitable slip to your demise. This is where Bix—in fact, all my Midwestern friends—cut their climbing teeth. He brought me here once at the end of last summer, on a day so hot and humid the chalk turned to paste in our hands. We spent as much time swimming in the lake as climbing above it. On this, the second morning of our weekend trip, we set our sights on Cleopatra’s Needle, a freestanding tower with a wobbly summit block. A variety of routes exist to the top, and since no fixed protection exists at the Lake—save for a few rusty pitons, gear left behind by the faint of heart, and one questionably trustworthy rap ring at the top of Cleo’s Needle—climbers may choose routes creatively, placing cams, nuts, and other objects on which it doesn’t look like you should bet your life in tiny cracks and crevices when they present themselves. This sort of climbing, the kind in which you carry all your own gear and place it at intervals, is called traditional climbing. If you’re cool, you call it “trad climbing,” and because I’m profoundly mediocre as most things I do, it probably won’t surprise you to learn that I’m not very good at it. My experience with placing protection has mostly been in snow, a medium on which I feel much more comfortable than on rock (especially quartzite). I’ve plenty of times followed a leader, taking the gear they’ve placed with me as I make my way up to them, but my first lead was on this very trip, and it was predictably ghastly. Each time I placed a piece of gear, I yarded on it with all my might, imploring it to hold me in the fall I hoped not to take, before clipping the rope to it and moving skyward. Despite that my clothes were bathed in fear-sweat, which I swear to you smells different than any other kind, I reached the top of the pitch feeling triumphant. I’d relied completely on my own instincts, which Bix, as he pulled the gear on his way up, confirmed were “mostly good.” Mostly good. That’s a start. My confidence dissipated almost immediately upon our arrival at the base of the Needle. Each route looked as perilous as the next, despite what the guidebook assured were very manageable ratings. My eyes worked their way slowly upward, looking for holds on what appeared to be a featureless slab of glass-rock. I swallowed hard as we sorted our gear and was relieved when Mel announced she wanted to lead it. As usual, apart from some mildly panicked sweating, I settled in once I started climbing. Before I knew it, I’d arrived at the ledge below the summit pitch, glad and a little surprised at myself, as usual, to exchange high-fives with my companions. We’d climbed the first pitch in a party of three, but given the diminutive square footage (approximately two) of the summit and that Bix had sat atop it many times before, it was decided that Mel and I should lead and follow the summit pitch, respectively. Bix rappelled to the ground as a turkey vulture circled overhead. I pretended this did not feel like a bad omen. One of the many things I miss about the Lower 48 when I live in Alaska is the afternoon thunderstorm. We don’t get thunderstorms in Southcentral Alaska: they require heat and moisture, a combination we rarely get in Anchorage’s coastal climate. I’d mentioned this earlier in the morning as we checked the forecast, which didn’t call for rain until late afternoon. In retrospect, my longing for a thunderstorm was probably akin to cardinal sins like bragging that I’d never broken a bone or gotten a speeding ticket. Mel led the exposed twenty-five feet from my belay ledge to the summit quickly and efficiently. As she topped out and settled in to bring me up, I watched dark, angry thunderheads form high above the bluffs. My heart sank as I remembered that, along with the powerful roll of thunder I so fondly associate with my childhood in the Rockies, the afternoon storm presents a particular quandary if you happen to be perched atop a feature with “needle” in its name: lightning. “You’re on belay!” Mel shouted down. Tiny droplets of rain began to sprinkle my belay stance, and I shuddered internally at the thought of moving up and down on wet quartzite. By the time I’d begun fiddling with Mel’s first piece of gear, I didn’t even want to go up anymore. I ordered my body to continue upward, jamming my swollen fingers into barely-there cracks and balancing precariously on holds no thicker than the width of my maxed-out credit cards. Mel uttered some encouragement and I looked up, my mouth too dry to articulate a response. Our eyes met as a crack of lightning hit the ground behind her, touching no more than half a mile away. Mel hadn’t seen the lightning, but her tone was nonetheless clear: we needed to get down. I finished the pitch and topped out with a real sense of urgency, almost dropping the last cam at a clap of thunder directly overhead. “Good climbing, buddy,” Mel said, her characteristic coolheadedness quelling the panic rising in my throat. We needed to hurry. Given the unsteadiness of the summit block (and the probable age of the metal ring installed at the top), we decided it was safer for me to downclimb what I’d just come up than for Mel to lower me off the ring. I’d stop at the belay ledge I’d just started from, Mel would drop the rope evenly so that one end hung over either side of the Needle, and we’d simul-rappel out of harm’s way, looking like a very soggy SWAT team. If this all sounds horrifying and complicated, that’s because it is, objectively speaking. As if feeling the same urgency I did, the raindrops increased in size and fervor. The rock was getting slicker by the second, which was just fine because I couldn’t afford to take my time: my partner was sitting atop a quartzite spire in a lightning storm with a great deal of metal attached to her. Despite our mutual alarm, we worked quickly, taking great care to hide the whites of our eyes from one another as we feigned collectedness. “Off belay!” I yelled over the din when I reached the ledge. Mel shouted something back, but I couldn’t hear a thing. Seconds later, she dropped the rope. I clipped in and peered over the edge as she prepared to drop the other end of the rope. To get down without dragging my lifeline over a jagged protrusion from the tower, I’d have to lunge from my ledge, swinging the length of rather a tall person out over what seemed an abyss. It looked awful, but I didn’t have the luxury of vacillation. I weighted the rope, hollered that I was on rappel, and, on Mel’s signal, hurdled into space. Dangling in midair and using only one another’s weight to counterbalance our own, we fairly floated to the ground, just as lightning struck all too close to the Needle. As if on cue, the heavens opened at the very moment our feet touched the earth, and we rushed to shed the metal from our bodies before fleeing to lower ground. 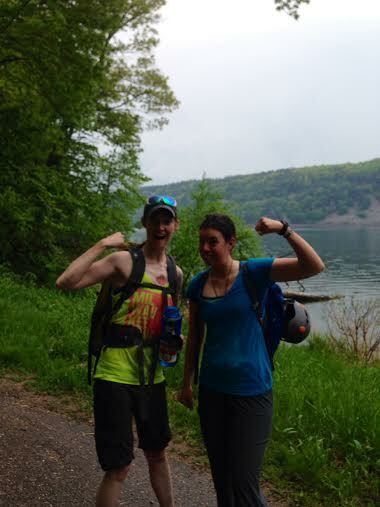 By the time we reached the shore, I couldn’t have been wetter if I’d dived right into the lake, clothes and all. I look over at Mel. She looks less haggard than I feel, but her deliberate sips of Coors and thousand-mile stare give her away. We were scared for a minute there. Someone makes a comment about the Memorial Day crowd, and we all chime in, grateful for the distraction. Slowly, surely, the mood settles to neutral, and soon we’re all laughing and discussing reverently the guilty pleasures we’ll consume on the way home. Way to go, friend! Congrats on your first trad lead. These all too intimate moments with nature are what put it all into perspective, you know? We can be one with rain and wind as well as sunshine and the perfect breeze.